From bathrooms to kitchens to entryways, there’s no place these dynamic little tiles can’t go. The humble penny tile, like the humble penny coin it’s named for, is all-but insignificant on its own. Paired with other penny tiles, though, it’s a dynamic, eye-grabbing bathroom tile design option. 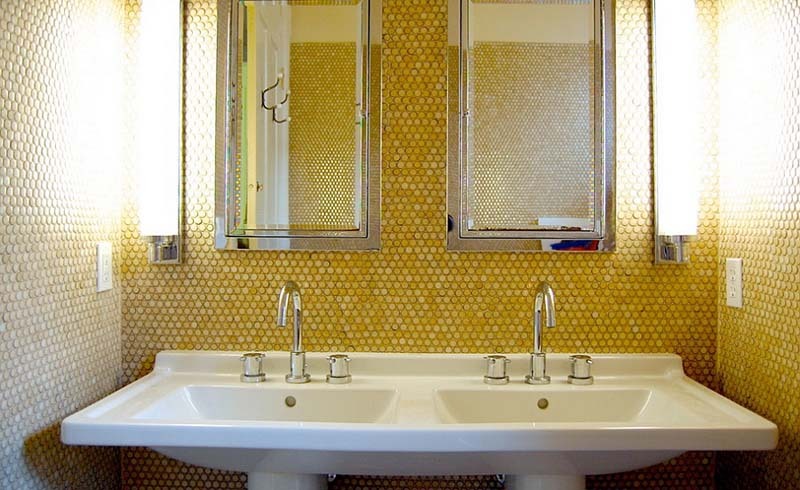 Penny round tiles can be used for a bathroom backsplash or a shower floor; they can be all one color, a rainbow of colors, or a carefully arranged pattern of just one or two colors. Sometimes, they can even be actual pennies. Penny tiles carry a certain retro vibe with them, but they can be used in ways that minimize the look—on a shower floor, for example, or as kitchen backsplash tile. Good-looking penny tile ideas prove that penny tiles can go anywhere: in the kitchen and bathroom, sure, but also in laundry rooms, mudrooms, and staircases. When picking penny tile, the final look relies, in part, on color. White penny tiles with black grout are the classic retro look, while black or gray penny tiles have a chic, contemporary look, and blue penny tile is delightfully unexpected. Of course, a mix of round penny tiles in any of these colors is also an option. Part of the revived penny tile trend includes creating mosaics out of the tiles—charming sayings, words of welcome, and cheeky phrases are popular variations. Classic penny tiles are ceramic, but marble penny tiles have a certain luxe look to them, and glass variations are glossy and sophisticated. Installing penny tiles can seem daunting, but it doesn’t necessarily need to be. Many tile stores sell them in squares or sheets, so installing the tiles one round at a time isn’t necessary. Of course, anyone who wants to dive straight into DIY can tackle the job for a more custom look. Another practical consideration: Penny tiles have a lot of grout, which can inspire tile cleaning fears. Some installations place the tiles close together, so there’s minimal grout to clean, though the classic penny tile look calls for more widely spaced tiles. If penny tiles still sound like a tile look to try, take a peek at the below ideas for nearly any style or type of room. The idea that penny tiles have to be in the bathroom isn’t true any more—these inspiration shots prove it. Penny tile shower floors are already a top use of the dynamic tile choice, but putting them on the shower wall—or walls—still feels fresh and new. Only one tiled wall serves as an accent feature, while full-shower coverage feels a little more luxe. Try installing penny tiles in an unexpected spot, like on stair risers, for a bold look that visitors will love. A bold shade—like emerald green—can be used all over without feeling overwhelming with penny tiles thanks to an abundance of white grout to temper the color. Penny tiles in a contrasting color can spell out playful phrases, reminders, and more for a bespoke look. Black penny tiles with white grout is a playful twist on the classic white tile, black grout look. Pair with metallic accents for a more high-end feel. Black penny tile with white grout looks playful and polka-dot–esque, but black tile with black grout is fully contemporary cool. Using thick strips of penny tiles in alternating shades creates a pretty, chic look without too much design expertise. 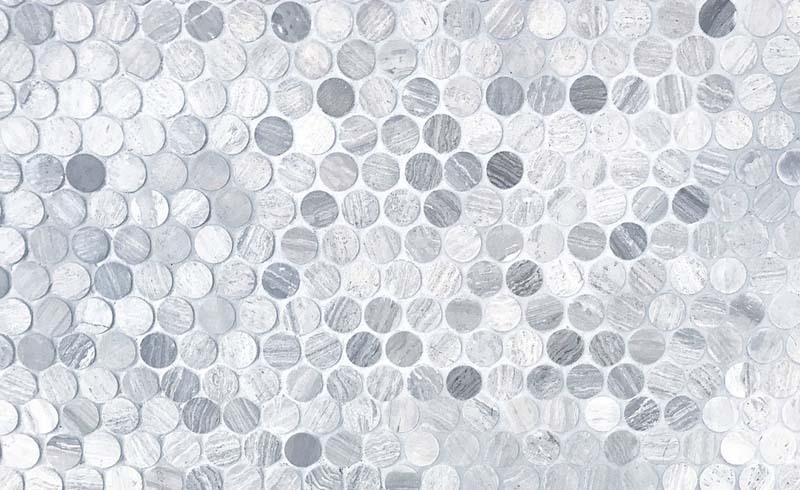 Penny tiles in a metallic or reflective finish have a maximalist, luxe look that can be blown out into a whole room or focused into a small pop of vibrancy. Reflective, mirrored tiles surrounded by luxe white marble tiles is the perfect balance of contemporary and traditional elegance. A blue penny tile bathroom backsplash paired with wallpaper of the same shade establishes a polished look without the trouble of installing a full wall of tile. A slightly eclectic look with penny tiles of different shades of the same color—in this case, gray—looks both creative and refined. Red and orange penny tiles interspersed across white grout seem both fiery and slightly feminine.